Marketing is a decision-based world. At any given moment, you've got a variety of options floating in front of you. Which of those two headlines should you use in your next e-mail? Which of those three font choices looks the best on your print flyer? Which of the three graphics will ultimately reflect your brand in the best way? If you're wondering how small changes will affect the greater success of your marketing campaign in the eyes of your users, why don't you just ask them? That, in a nutshell, is what A/B testing is all about. 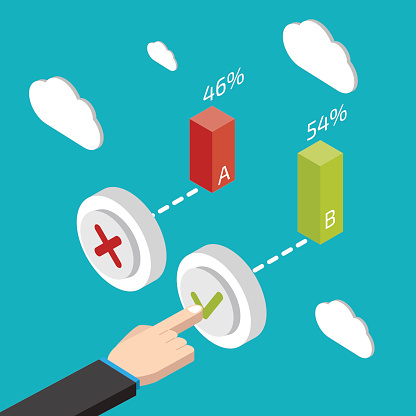 Sometimes referred to as split testing, A/B testing involves comparing two or more versions of something to see which one is more effective. In marketing terms, it's easy to see the value of this approach almost immediately. Do you have two similar, yet different, versions of an e-mail subject line and are wondering which one might be the most effective? Get an e-mail list of 100 of your average customers together and try both at the same time. Send one version to a group of fifty customers and the second version to the other fifty. See which one performed better (and why) before making the decision of which one to use for your whole campaign. Don't just take our word for it - there is a wide range of statistics that prove just how valuable A/B testing can be. According to a study conducted by Steelhouse, A/B testing is THE most used method for improving conversion rates in marketing campaigns. It isn't just marketing companies that are getting in on the action, either. During his re-election campaign, President Obama was able to raise an additional $60 million dollars through a carefully designed, calculated A/B testing regimen. The important thing to understand is that you can (and should) use and A/B test on every portion of your campaign before you bring it in front of the eyes of the widest possible audience. Take your website, for example. As the "welcome mat" of your virtual identity, A/B testing your website is the perfect way to see which of those two designs you're thinking of is better. This is incredibly common - in fact, Pardot research revealed that Google ran more than 7,000 A/B tests on its own interface in 2011 alone. But again: it doesn't actually matter what you're A/B testing, just that you are. In print marketing, this concept can be just as effective. The key is that you're not taking anything for granted. You're getting your collateral in front of the eyes of real people, seeing how they respond, and then using that as the basis of actionable decisions that you make moving forward. In the world of marketing, it's important to remember the old saying of "you can only make one first impression, so you'd better be sure that you're making a good one." Launching a campaign before it's ready means you can potentially shoot yourself in the foot before you've even had a chance to begin. Investing in A/B testing is one way to avoid exactly that type of problem for now and for all time.